One of the most important US commercial varieties for many years, Rome Beauty is considered one of the best cooking and processing varieties available. It originated around 1817 when Zebulon and Joel Gillette, along with their brother-in-law, bought several fruit trees from a nurseryman in Marietta, Ohio. The trees were taken to Rome Township in Lawrence County, Ohio, and planted there in the Gillette orchard. 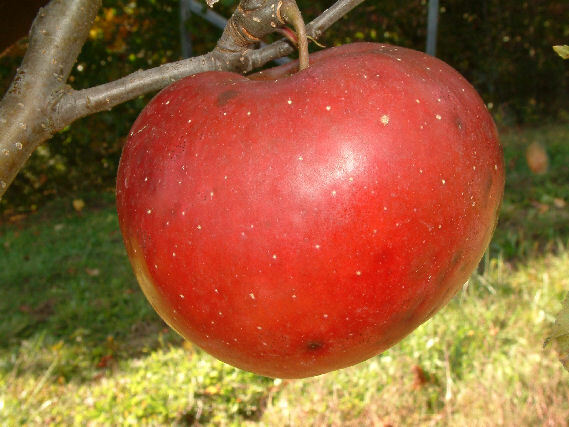 According to the historical literature, Joel Gillette pulled off a root sprout and gave it to his son, saying, “Here is a democrat, you can have it.” The sprout was transplanted in a corner of the orchard and within a few years began producing large and attractive dark red apples. Fruit is large to very large, roundish to somewhat oblate in shape. The thick, smooth skin is yellowish-green almost entirely covered with bright red and dark carmine stripes. The yellow flesh is firm, crisp and juicy with a tangy pleasing flavor. Ripens in September to October and keeps well.